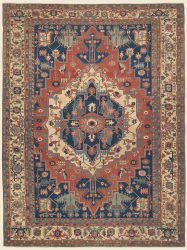 Fine 19th century antique Serapi carpets include some of the most rare and desirable large size decorative Persian carpets. 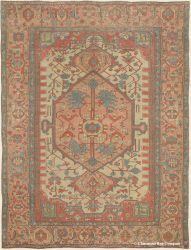 Woven in the rugged mountains of Northwest Persia, Serapi rugs are a distinct Heriz region style, with finer knotting and more large-scale, spaciously placed designs than other rugs from this area. Antique Serapis have historically been the carpet of choice in early American state and federal buildings, including the White House. 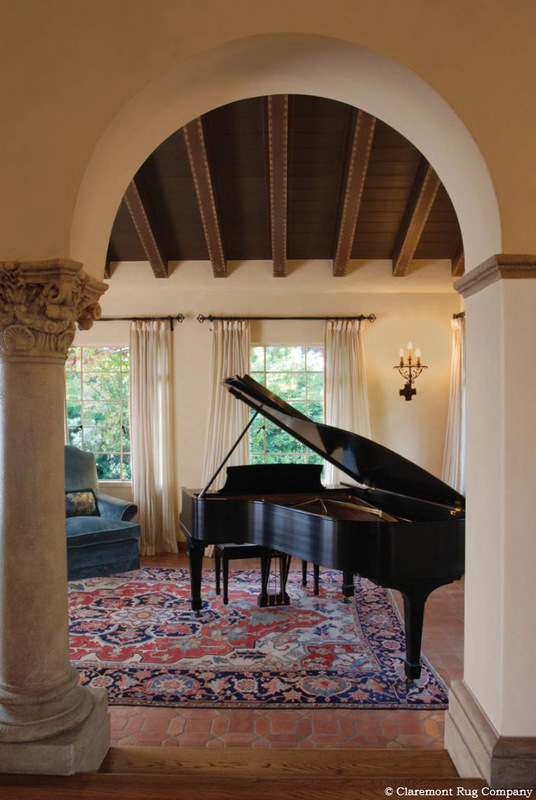 Today, our clients use graphic, casually elegant Serapi carpets in decors ranging from traditional to contemporary, Arts and Crafts, eclectic and postmodern. 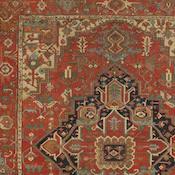 The heavy use that Serapi carpets often withstood also meant that significant restoration commonly was necessary to preserve many of the finest Serapi antique Oriental rugs.  If done skillfully and thoroughly, restoration not only allows the continued use of these majestic antique carpets, but also increases their investment value. 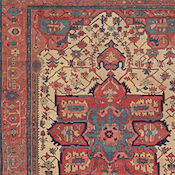 19th-century antique carpets with only a moderate amount of skillfully executed restoration are quite rare and, if of excellent quality and strong artistic impact, are extremely desirable. 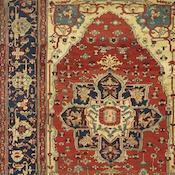 Antique Serapi carpets are usually found in the room size format from 9×12 to 11×14. 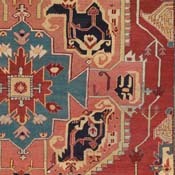 Happily, oversize Serapi carpets measuring 11×15 to 12×18 are sometimes found, and the best examples woven pre-1900 are deeply prized. 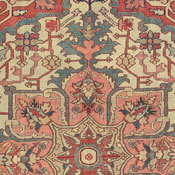 Very occasionally extremely large antique carpets woven in sizes up to 16x 26 can be found. 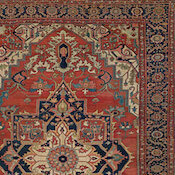 Area-size Serapi rugs, measuring 4ft x 5ft to 5ft x 6ft 6in are very seldom encountered and cherished by connoisseurs. Although rarely found, Serapis runners and keleges (corridor-size runners) make stunning complements to decors featuring room size or oversize Serapi carpets. 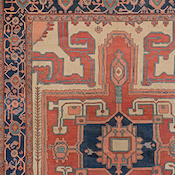 Our 19th-century Serapi carpet collection reflects a tremendous range of originality within this style and a consistent joie de vivre. Along with our carefully selected, yet vast inventory of room size and oversize antique Serapis, we also proudly maintain great examples of this beloved Northwest Persian rug type in hard-to-find runner, corridor carpet, area size and palace sizes up to 17×25. Having had the pleasure to place so many of these wonderful carpets, we can attest to the magical element they bring to a wide range of decors. 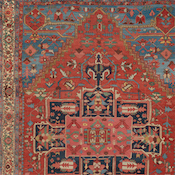 The rarity of the best antique Serapis with pure vegetable dyes, graphic designs and inspired artistry make them excellent investments, occupying an important position in both the American and international art markets.